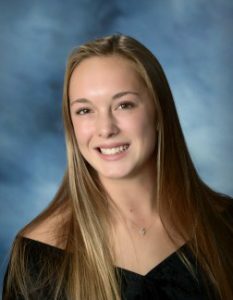 Warwick Valley High School is proud to select senior pole vault champion Kaeli Thompson as this weeks’ Bill Garcia Allstate Student Athlete of the Week. Kaeli is a two-time All American and four-time All State Pole Vaulter for the Warwick Valley Wildcats. She is currently ranked No. 1 in the U.S. with a recent indoor vault of 13’ 3 ½” at the Armory. Kaeli has an academic average of 102.7 and is a member of the National Honor Society, Mu Alpha Theta Math Honor Society, Student Senate and Pi Epsilon Theta Physical Education Honor Society. She is enrolled in Advanced Placement courses in calculus, university Spanish, English literature and government for college credit. Kaeli has accepted an athletic scholarship to attend Duke University as a top recruit for the track team and member of the 2023 Blue Devil senior class. She is the daughter of Heather and Greg Thompson. Her sister Kristin is a sophomore rising star on the Warwick Valley campus.